A Messianic Jewish perspective of the Holy Spirit and spiritual gifts from the 2013 Shavuot Conference. An exciting new Vine of David biography about one of Messianic Judaism’s founding fathers. The story of entering the promised land reveals a pattern which explains our relationship to the kingdom. 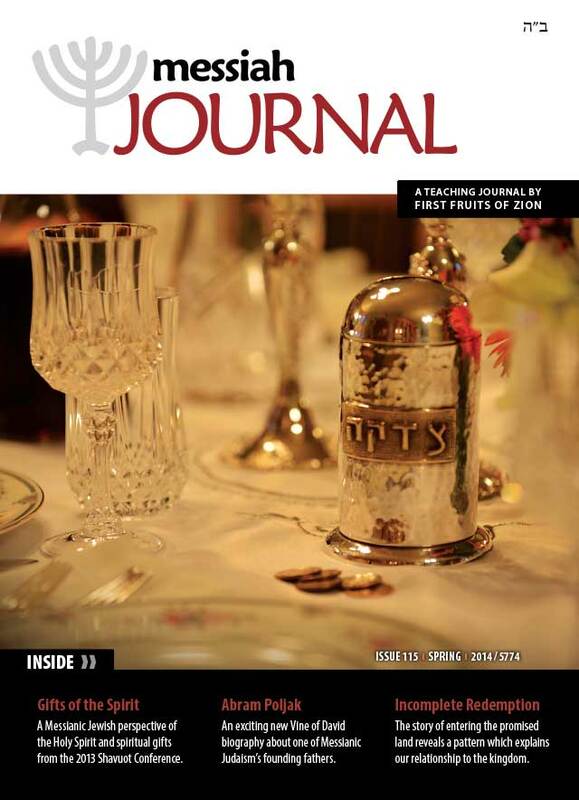 Director's Letter: Next Issue in Jerusalem! Boaz Michael discusses among other things, his family's move back to Jerusalem and what it means for FFOZ, and the recent First Fruits of Zion Creative Team meeting. What does it mean that "the Holy Spirit was not given before Yeshua was glorified"? What is the Spirit? D. Thomas Lancaster explains the meaning and significance of the outpouring of the Spirit as a token of the coming kingdom. The prophets have foretold that in the Messianic Era a manifestation of the Holy Spirit will take place, and various supernatural gifts and attributes will be poured out onto mankind. Do the gifts of the Spirit listed in 1 Corinthians 12 hearken back to ancient prophesies about the kingdom of heaven? Jeremiah Michael demonstrates how the spiritual gifts described in Paul's epistles are rooted in Messianic prophecies. Jacob Fronczak also continues his outstanding series of the five Solae of Protestant theology with a provocative article about Sola Fide, "Faith Alone". Previously in this series, we explored the fundamental problems with the doctrine of sola scriptura as it is commonly understood by modern Protestant Christians. Refer to Messiah Journal #111, #112, and #113. In previous centuries, and during the Reformation era, Sabbath-keeping, Torah-observant Christians emerged in many places around the world. Learn more about these groups and their amazing journey, and how can we avoid some of their mistakes and fate? As we move forward in our study of the themes of exile and redemption, we must take into account one more foundational event regarding this topic in the Torah: in one case of exile in Scripture, rather than the exile being a forced departure from the land of Israel, it was a failure on the part of the people to enter the promised land in the first place. Previous articles by Aaron Eby in this series, focusing on Redemption in the Tanach can be found in Messiah Journal #110, #113, and #114. The Holy One, blessed be He, said to Abraham, 'I have two goodly shoots to engraft on you: Ruth the Moabitess and Naamah the Ammonitess.' (b.Yevamot 63a). In this article, Toby Janicki look at the concept of being "grafted in", from a Rabbinic perspective. An exciting new Vine of David biography about one of Messianic Judaism's founding fathers. The story of Abram Poljak, Messianic Jewish Pioneer, and his prophetic teachings about the kingdom, in his own words. Return of the Kosher Pig? Can it be that the rabbis used "the kosher pig" as a name for Messiah? In this article, Messianic Rabbi Dr. Carl Kinbar challenges the premise behind a newly released Messianic book by Rabbi Itzhak Shapira, The Return of the Kosher Pig, where he claims that "kosher pig" is one of the titles of Messiah. More reviews: Documentary film: The Chosen People, Director/Producer: Igal Hecht. Book: Jesus' Gospel: Searching for the Core of Jesus' Message: A Messianic Commentary by Joshua N. Tilton.